This is a good example of the type of Greyhound stations that were built across the country in the early Twentieth Century. The structure marks the cessation of the Main Street building movement not furthered until the late 20th century. In August, 1940 Central Greyhound Lines purchased the property at 664-672 Main at a cost of $185,000, from Erie County Savings Bank, to replace the terminal they had rented since 1930 at 640 Main Street, formerly a dance hall, and prior to that a market. The new structure served as a terminal for eight other bus companies with loading dock accommodations for 11 buses. The depot was officially opened April 29, 1941. It was built of concrete and steel with stainless steel and aluminum alloy trimmings, at a total cost of $385,000 (2002 equivalent: $4,901,583). Siegfried Construction Company of Buffalo was the construction firm. The terminal runs the entire block between Main and Pearl Streets and has a frontage on Main Street of 100 feet. On the main floor the 232 foot long terminal was designed with a spacious waiting room, travel bureau, ticket counter, telegraph offices and facilities for baggage and parcel-checking. Four gates led from the main waiting room to the loading platform which extended the entire length of the building. A restaurant with facilities for accommodating 150 people was on the Main Street side with the second floor housing offices. The Buffalo architect Roswell E. Pfohl worked in collaboration with the architect for Greyhound. Mr. Pfohl was one of the area's foremost architects and engineers, having practiced for 47 years. He was Senior Partner of the firm Pfohl, Roberts and Biggie. Born in Buffalo he attended local schools before transferring to MIT, where he graduated in 1922. He is noted for his work on the new Federal Building (111 West Huron), the Buffalo City Court Building and the altar design for the rebuilt St. Michael's Roman Catholic Church, after the 1962 fire. Movie set: The building was emptied by Greyhound in 1979 when new terminal space was erected on Ellicott and North Division Streets. During the summer 1979 the depot was used by Metro-Goldwyn-Mayer in connection with the film Hide In Plain Sight. Police substation and community center: On June 9, 1979 the City of Buffalo announced that it would purchase the depot from Greyhound Corporation for $50,000 (2002 equivalent: $636,569). The City would renovate the building as a police station and community center. 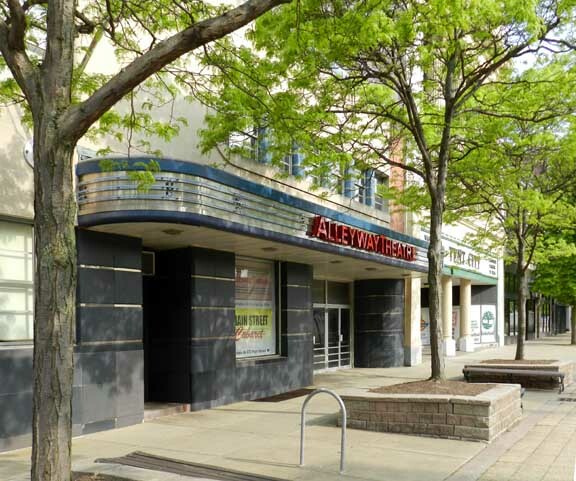 Alleyway Theater: In July, 1983 the Buffalo Theater Collective began leasing bus terminal space from the City with plans to renovate the waiting room into a 250 seat theater. The official opening of the theatre, named Alleyway Theatre, was December 5-7, 1985. The theatre seats 125-200 people with the entrance in the alleyway between the Precinct station and Swiss Chalet. The two and one-half year renovation to convert the space cost $60,000 (2002 equivalent: $763,883). On August 8, 1985 the alley that connects Main and Pearl Streets between the Theatre District Police Station and the southerly building was dedicated "Curtain Up! Alley."